This note draws on past FRA materials on the fundamental rights of migrants in an irregular situation who cannot be removed. It draws attention to the obligation of EU Member States to provide them with a certification of postponement of removal and to grant them access to core fundamental rights. In 2011, a FRA report found that EU institutions and Member States should pay more attention to the situation of migrants in an irregular situation who have been issued a return decision but who have not been removed. It called on Member States to avoid situations where people who are not removed remain in legal limbo for many years. Current EU policy developments bring this issue again to the forefront, as some legislative and policy measures to speed up asylum procedures could lead to rejections of application of people who need international protection, for example, because of not cooperating with the authorities. Human rights considerations may prevent their removal; this will increase the number of migrants staying in the EU in a legal limbo. This will not only affect their fundamental rights but also pose new challenges to EU Member States, which are undesirable from the human security and the public order perspectives. Most fundamental rights apply to everyone, regardless of legal status. The Charter of Fundamental Rights of the European Union (‘the Charter’), the European Convention of Human Rights (ECHR) as well as international human rights law enshrine fundamental rights that apply to everyone. However, some rights are limited to nationals, EU citizens (under the Charter) or legally residing non-nationals. As a result, unless individuals are expressly excluded, fundamental rights and freedoms apply to everyone within Member States’ jurisdiction, which includes migrants in an irregular situation. There are two broad categories among the population of migrants in an irregular situation in the EU. A first group is composed of those who are in hiding. Their stay is not known to the police or immigration authorities. A second group consists of third-country nationals whose presence in the territory of EU Member States is known to the immigration authorities, but who are not removed due to legal, humanitarian, or practical obstacles or due to policy choices. In these cases, national authorities may decide to suspend, not issue or merely not enforce a return decision issued pursuant to the Return Directive (Directive 2008/115/EC), without, however, granting residence rights. The presence of people who are in return procedures but are not removed is a Europe-wide phenomenon. The implementation of the new recast EU asylum acquis, once adopted, could potentially increase the number of such people, and a similar effect might be attributed to recent case-law of the Court of Justice of the EU (see e.g. case C-562/13 (Abdida) requiring automatic suspensive effect of appeals against return decisions if there is a real risk of ill-treatment in case of return). This note focuses on migrants in an irregular situation who cannot be removed from a given EU Member State due to legal impediments. This category of non-removed people includes, for example, rejected asylum seekers whose removal is barred by legal obstacles or people who have appealed a return decision and the return is hence suspended. The legal obstacles to removal encompass a number of human rights law considerations, such as the protection of private and family life (Article 7 of the Charter and Article 8 of the ECHR); the principle of non-refoulement (Article 19 (2) of the Charter and Article 3 of the ECHR) as well as humanitarian considerations related to the country of origin. They also encompass the best interests of the child (Article 24 (2) of the Charter and Article 3 of the UN Convention on the Rights of the Child) as well as medical and health conditions as interpreted by the European Court of Human Rights (ECtHR). 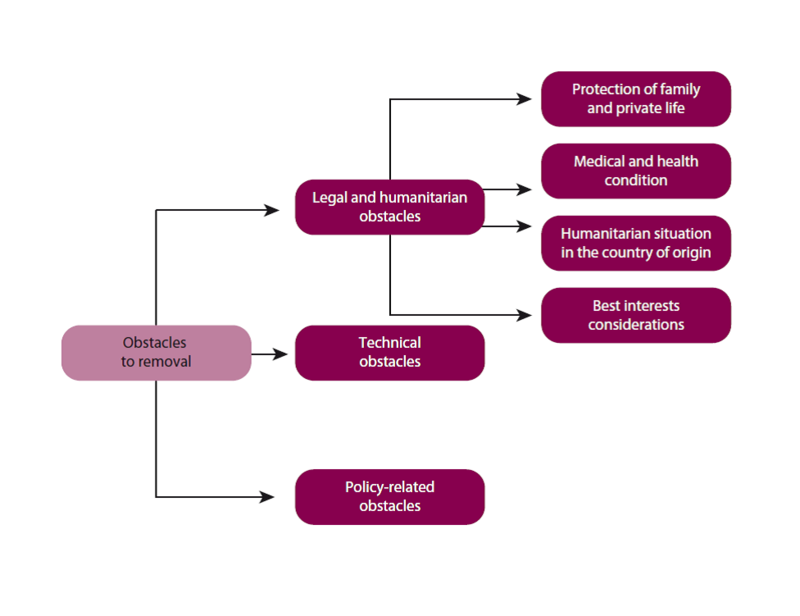 The below figure portrays different possible obstacles to actual removal as well as legal and humanitarian obstacles. All third-country nationals who are present in a Member State are entitled to a minimum set of rights under the Charter and other applicable instruments of international human rights law, such as the ECHR and UN human rights instruments. Therefore, EU law as well as national law must provide access to certain basic rights of non-removable migrants in an irregular situation, which everyone shares. Under EU law, the EU Return Directive contains only limited guidance on the fundamental rights guarantees for people who cannot be removed. Article 14 and recital (12) set out safeguards, which apply if removal is formally postponed. It does not provide for any mechanism to end situations of legal limbo deriving from protracted non-removability. The situation of third-country nationals who are staying illegally but who cannot yet be removed should be addressed. Their basic conditions of subsistence should be defined according to national legislation. In order to be able to demonstrate their specific situation in the event of administrative controls or checks, such persons should be provided with written confirmation of their situation. (2) Member States shall provide the persons [concerned] with a written conformation in accordance with national legislation […] that the return decision will temporarily not be enforced. Added to this, the Return Directive prohibits detention where prospects for removal no longer exist (Article 15(4)). However, it provides only limited guarantees to ensure that people in return procedures who are not removed are treated in accordance with basic fundamental rights standards. Although the directive foresees the possibility of Member States granting residence permits for “compassionate, humanitarian, or other reasons” (Article 6 (4)), national authorities enjoy a wide margin of discretion in this regard. Nevertheless, Member States are under a legal obligation to formally suspend removal when it would violate the principle of non-refoulement or for as long as suspensory effect is granted during the judicial review of the return decision (Article 9 (1)). The safeguards guaranteed in the Return Directive are not comprehensive as they do not reflect all fundamental rights to which migrants in an irregular situation are entitled to under international law (for example, they do not mention access to justice or the right to be registered at birth). Given that the Return Directive does not provide any mechanism to put an end to situations of legal limbo that derive from protracted situations of non-removability, it is up to the EU Member States to deal with this group of migrants in an irregular situation in a fundamental rights-compliant way as required by all relevant human rights standards, including the Charter and the ECHR. It is in this spirit that the European Commission highlighted in its 2014 Communication on the EU Return Policy and in the 2015 Return Handbook that it is essential to avoid protracted situations and to ensure that people who cannot be removed are not left indefinitely without basic rights and are not unlawfully re-detained. The Return Handbook, published by the European Commission in October 2015, provides detailed guidance on the applicable fundamental rights standards pending return as well as on the more specific requirements of the written confirmation. The provision of emergency health care is a basic minimum right and access to it must not be made dependent on the payment of fees. Access to education: The limitation of “subject to the length of their stay” should be interpreted restrictively. In cases of doubt about the likely length of stay before return, access to education should rather be granted than not be granted. […] As regards practical problems, such as cases in which the minor does not have a document proving the education already obtained in other countries or cases in which the minor does not speak any language in which education can be provided in the Member State, appropriate answers need to be found at national level, taking into account the spirit of the Directive and relevant international law instruments such as the 1989 Convention on the Rights of the Child and General Comment No. 6 thereto. Inspiration may also be drawn from the asylum acquis […]. Other basic needs: In its judgement in case Abdida (C-562/13), the [Court of Justice of the European Union (CJEU)] found that Member States are obliged to also cover other basic needs, in order to ensure that emergency health care and essential treatment of illness are in fact made available during the period in which that Member State is required to postpone removal. It is for the Member States to determine the form in which such provision for the basic needs of the third country national concerned is to be made. The logic upon which the [CJEU] relied to establish this obligation was that the requirement to provide emergency health care and essential treatment of illness under [the directive] may be rendered meaningless if there were not also a concomitant requirement to make provision for the basic needs of the [person]concerned. Based on this logic developed by the [CJEU], and in light of the indications provided for in relevant case-law of the ECtHR, it can be derived that enjoyment of the other rights enumerated in Article 14 (1) (such as in particular: access to education and taking into account needs of vulnerable persons) also give rise to a concomitant requirement to make provision for the basic needs of the third country national concerned. Form of the written confirmation: Member States enjoy wide discretion. The confirmation can either be a separate paper issued by the national authorities or part of a formal decision related to return. It is important that it allows the returnee to clearly demonstrate – in case of a police control – that […] he/she is subject of a return decision which can temporarily not be enforced. The confirmation should specify, if possible, the length of […] the postponement. In Member States in which data exchange systems allow for the quick verification of the status of irregular migrants in case of police controls on the basis of certain personal data or reference numbers, the written confirmation requirement can be considered as fulfilled if the person is provided with (or already owns) documents or papers containing these personal data or reference numbers. In conclusion, this issue is already quite significant. Extrapolating from the statistics on the rate of effective removals per year, this group could potentially amount to approximately 300,000 individuals each year. New policies should be carefully assessed so as not to have the unintended effect of increasing the group of people who are non-removable and at the same time remain in legal limbo.